It is a common misconception that Egyptian hieroglyphic writing is a kind of ‘picture writing’, and as such is the opposite of our own alphabet, in which each sound of the language has a single corresponding letter. ‘Picture writing’, we may suppose, is primitive and cumbersome à la Fred Flintstone, whereas an alphabet is a simple and efficient response to the problem of recording human thoughts and speeches. In this engaging and attractively illustrated introduction to the worldwide phenomenon of writing, available at last in paperback, Andrew Robinson demonstrates how much more subtle the situation really is. Of course, a simple glance down at my computer keyboard indicates that there is much more to the English writing system than the Roman alphabet. There are indeed twenty-six letters used to write sounds, but there are many more signs in common use, including punctuation marks, the spaces between words, and logograms like 4, £, :-) and + (a logogram is a conventional symbol, often writing a whole word, whose meaning can be learned but not worked out simply by looking at it). We also use determinatives, which do not help to write the sound of a word but indicate something of its meaning, e.g. capital letters indicate names, and‘ph’ for ‘f’ indicates a word derived from Greek, like ‘filosofy’. Then there are abbreviations, chemical symbols, musical notations, road signs, and pictograms like J and the signs on the toilets in pubs… And what of orthography, calligraphy and typography, which in many cultures have elevated writing to high art so as to celebrate the profoundest beauties and mysteries of this world? Using a wealth of examples from ancient and modern writing systems, Robinson demonstrates that no writing system is purely phonetic nor purely pictorial. Some lean more heavily towards representing sounds, including in fact Egyptian hieroglyphs, which are usually used to write down the sounds of words in the Ancient Egyptian language. Nevertheless, as in the case of our own alphabet, hieroglyphic sound-signs are often combined with other signs which work differently. On the other hand, the Chinese script, after more than three-thousand years of development, leans more heavily towards the representation of whole words using logograms. But Chinese writing still has a significant phonetic element, and this element has even been increased (and more recently supplemented by western symbols) in order to be able to write the unrelated Japanese language as well. Inevitably there are quibbles to raise with this book: some specific, e.g. the inaccurate system used for transliterating Ancient Egyptian words; others more general, e.g. Robinson’s bold assumption that all writing systems had the same original inspiration – accountancy. This may be true of the earliest-known writing systems of the Middle East (cuneiform) and Europe (Cretan Linear B), but the surviving texts suggest otherwise for the oldest writing systems of Africa (Egyptian hieroglyphs), the Far East (Chinese), and America. Nevertheless, if you find writing a bit of a bore (do you write ‘4U’ in your e-mails because ‘for you’ is too much like hard work? 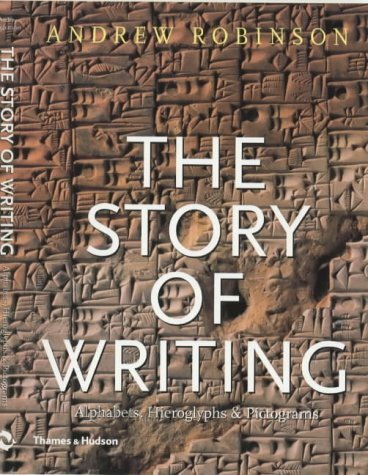 ), you would do well to browse Robinson’s book and rediscover the magnificence of the human achievement that is the ongoing story of writing. And since you are presumably interested in Ancient Egypt, perhaps you’ll realise that anyone who has mastered the complexity of the English writing system need have no fears about learning to read Egyptian hieroglyphs. The Story of Writing. Alphabets, Hieroglyphs & Pictograms by Andrew Robinson is published by Thames & Hudson. Amenhotep III ruled Egypt for thirty-seven years at a time when the power and influence of Egypt was at its zenith. Visitors to Egypt today often find that his reign is often overlooked and overshadowed by that of other rulers, notably Ramesses II, who added to many of Amenhotep’s monuments and usurped many of his statues. 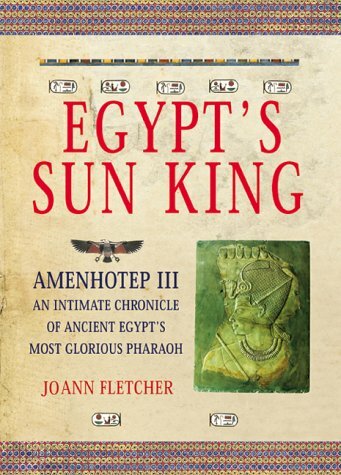 Joann Fletcher has long been an admirer of Amenhotep III and has taken the opportunity to present a detailed account of his reign and his achievements in an attempt to redress the balance. This period of Egyptian history is perhaps one of the most fascinating, coming just after a time when the Egyptian Empire had reached its greatest extent, with tribute flowing into the country, and just before the reign of Amenhotep IV/Akhenaten and the so-called Amarna Revolution. In recent years many scholarly articles have been written on Amenhotep III and there have been international exhibitions on his life and times. Joann Fletcher brings together in one volume all the latest ideas and theories about this period, presenting them in a clear and logical way, taking us through the reign of Amenhotep year-by-year. No reign has ever produced such an abundance of outstanding sculpture and fine art, which can be seen today in museum collections around the world. Amenhotep built extensively at the temple of Amun in Karnak and completely re-built the temple at Luxor. His mortuary temple at Thebes was massive, although today all that survives are the two colossal statues, which once flanked the entrance, known to us as the Colossi of Memnon. At Malkata he built a huge palace, with sumptuously decorated rooms for both public and private use. In the pages of the book we learn of Amenhotep’s relationship with his Great Wife, Tiye, of his hunting prowess and also gain an insight into the politics and diplomacy of the period, with international correspondence surviving from the royal archives. One of the most interesting and important aspects covered in the book is the rise of the cult of the Aten, which began in the reign of Amenhotep III and not in the reign of his son as had previously been supposed. Towards the end of his reign, Amenhotep declared himself to be the living personification of the Aten and the "Living Sun". This book really does redress the balance of our knowledge of Amenhotep III and his time and puts his long and important reign in its historical context. The book is profusely illustrated with excellent colour photographs, many of which are published for the first time. For beginner and enthusiast, this book is thoroughly recommended. Think of the great Egyptian collections in museums around the world, and Brussels in Belgium might not readily spring to mind; in which case the second volume of the CD-ROM Egyptian Treasures in Europe will be a welcome revelation. Volume I in the series looked at 1,000 highlights from European collections. Volume 2 is the first in the series to deal exclusively with one collection, in this case the Royal Museums of Art and History in Belgium, and 1500 objects are included. As with Volume 1, the technology used is impressive and easy to use. Objects can be viewed by type, material, period or site and are viewed initially as a thumbnail image. This image can then be enlarged, which then brings up a full description of each item. Even more information on the object (materials used, etc) is also available at a click of a button. If there is an inscription, a transcription, transliteration and translation is available, a full bibliography of the object and finally, under "advanced" details of when and how the object was obtained, accession number etc. Whilst a CD-ROM will never replace actually seeing an object in a museum case, it can undoubtedly provide far more detailed information on each object than any museum could ever hope to display. As such, a tour of the CD-ROM could be said to actually be more rewarding than a tour of the museum! The Egyptian Collection in Brussels is impressive and covers all periods of Egyptian history with a wide range of objects. Unlike most European collections, the origins of the Brussels collection are more recent. In 1850 there were just nine or ten objects. In 1861 two hundred other objects were donated and in 1884 the collection was doubled by another donation. The bulk of the collection was assembled under Egyptologist Jean Capart (1877-1947) who worked for the museum for half a century. Under his guidance, the museum received objects from excavations and also purchased items on the open art market. There are now some 9,000 objects in the collection, only a small part of which can be placed on actual display (or even included on one CD-ROM). The collection is rich in objects from the Predynastic and early periods. The Dynastic period is well represented by a full range of items, from small, personal domestic items, to substantial and important pieces of sculpture. Right at the end of Egyptian history, there is a good selection of Graeco-Roman objects and also many from the Coptic period, including a fine collection of textiles. It is difficult to single out individual objects and every visitor to the museum or CD-ROM will have his or her favourite. I was impressed by a fine head of Menkaure from the Old Kingdom and some Akhenaten ushabti heads, but, with the wealth of information available on each object, even a simple pair of tweezers become far more interesting to view on the CD-ROM than perhaps they would be in the museum. The CD-ROM is a delight and can be "visited" again and again, perhaps choosing a different set of objects to view in detail each time. The CD-ROMs are "multi-platform" (sorry to get technical – this means they will work on a PC or Apple Mac) and the information on the CD-ROM is available in seven languages. Volume 3 in the series will be on the Egyptian Collection in Dublin and Volume 4 on Liverpool. Both are planned to be published before the end of the year. Animal imagery filled the worlds of the living and the dead in ancient Egypt. The author leads us directly into the thought of the Egyptians in the opening chapter, The Divine Bestiary, with its hawks and jackals, rams and cats. Some domesticated animals in Egypt had a divine role too, while others were excluded from the pantheon. "In a culture where the secular and sacred spheres of life were often indissolubly linked, the ancient Egyptians established profound and vital relationships with animals," writes the author. "Perhaps no other civilisation in human history has the association between humans and animals been as intimate or intense as in pharaonic Egypt." Perhaps this has something to do with the fact that we can trace the long history of the relationship between humans and animals right to ancient times in Egypt from the early fears and desires of hunters, through the committed husbandry of herdsmen to the age settled farmers and stockraisers. All these stages are present in the Egyptian pantheon too. It is sometimes said that the ancient Egyptians divided animals into beasts of chaos and order; the truth is more complex than that, as even feared animals could take on a significant role as protectors of the king, or symbols and emblems of kingship. On a more mundane level, the eyes of Egyptian artists captured animals in their natural environment, resting, hunting, fleeing – forever on the walls of tombs and temples. It is these lively and vivid scenes that are still amongst the most popular of attractions in Egyptian sites and museums today. 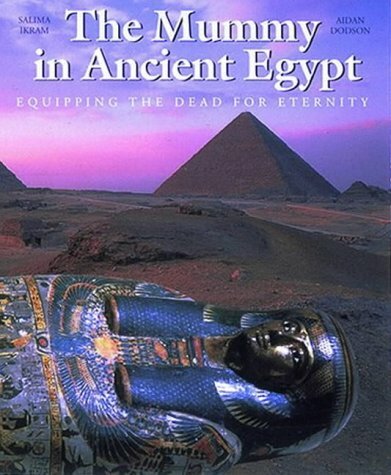 This book was written, the authors state in the preface, in response to a need for a comprehensive coverage of the Egyptian "burial complex". It is comprehensive indeed, and when one comes to examine the other books available, their statement is true; most books concentrate on a single aspect, be it royal mummies, a particular interment, an aspect of the grave goods or burial rites, or a particular investigation or series of investigations. 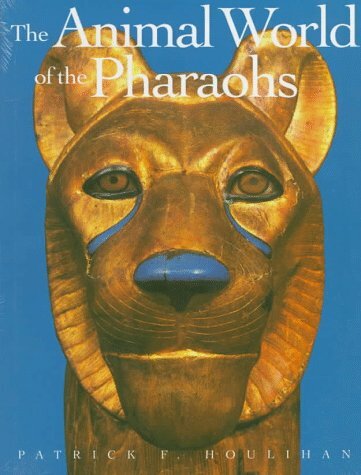 The book opens with a very comprehensive list of Egyptian monarchs and dates, before leading into an overview of the Egyptian burial itself and thus into a history of mummies and their sometimes unfortunate treatment at the hands of robbers and early investigators. Rest in peace? Some of them led as exciting an existence after death as before it, with frequent removals for "safety" as well as for other purposes. Mummies in their time have been icons, emblems, side-shows and commodities too. Aspects of the mummification process and burial equipment (divided into amulets, wrappings, masks, coffins, sarcophagi and canopic items) are also studied in depth in a very clear and logical layout, supported by the numerous excellent photographs and line drawings (a real plus in this volume). These various aspects are then summarised in an illustrated timeline. The book also includes a brief but comprehensive glossary, and then – inspired idea – a series of maps showing the list of significant cemeteries of Dynastic date, before concluding with a section on royal mummies and a bibliography for further detailed research into a particular area of interest. So, if you were so inspired, like one of the characters in Three Men in a Boat, you could make a tour of the principal burial sites of Ancient Egypt. You’re a young man in search of a good time? Oh, do come and see the tombs, sir! Come and see the tombs!